You are at:Home»Cruise Tips»Are the Additional Charges Worth It? Are the Additional Charges Worth It? Something which narks many people about modern day cruises is the wide array of dining options which come at an additional cost. Of course it isn’t the amount of dining options that bothers them, it’s that additional cost which can vary massively across cruise lines. Some people flat out refuse to pay any extra for dining, preferring instead to eat in the main dining room. Others however, seem more than happy to pay a little bit extra for something which often is more than a little bit special. 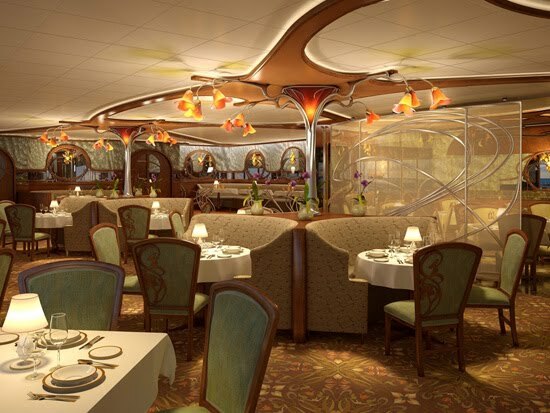 There has been a bit of controversy surrounding this subject lately as Disney Cruises announced the charge for one of their speciality restaurants on the Disney Dream (Remy’s) was $75 per person. That price is without wine pairings – they cost an additional $99. At first, those prices seem a bit scandalous right? You’ve already paid for your cruise (inclusive of food) so why should you have to pay more to dine in a speciality restaurant? Well I guess the answer is that you don’t. That is, you don’t HAVE to pay more, it is an option and surely it is better for that option to be there for those passengers who wish to take it up, than it not to be there at all. $75 per person isn’t cheap. If you go with your partner (which I’m sure most will – unless you’re evil like me, I would just send him down to the buffet!) then you’re looking at $150. However, the menu has been created by award winning, michelin star chefs. The food you will eat at Remy’s will be unlike any dining experience you have had before, either on a ship or on dry land. You are not only paying for the food, you are paying for the experience. It is a chance to get away from the crowds on a ship, to get away from kids (which is probably tough on a Disney cruise ship), and just enjoy a bit of luxury. I am sure Disney Cruise Lines don’t count on people returning night after night to eat there, but for a one off special occasion, $75 isn’t too bad and is certainly less than you would pay for a similar quality meal in London/New York. My personal experiences of speciality restaurants have always been extremely positive. I love the service, the atmosphere and the food is always more than a cut above that found in the main dining room. I wouldn’t want to eat in speciality restaurants every night because it would make them, well, less special I suppose. I do however, love that I have the option to go there and no matter how much they want to charge me, I appreciate being given a choice.